Thanks you so much Marlena and please say thanks to all the team involved in creating and delivering it. Yes thank you very much. 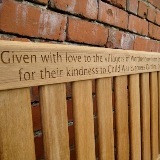 The bench was lovely and I am sure the recipients will be very pleased. 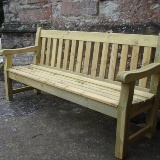 Yes John delivered the bench and I was thrilled with it as were others who have seen it. Your service has been brilliant and I hope we will get to use your firm again and would certainly recommend you. Yes they arrived on time. They are fantastic . Just dropping you note to say how happy my sister and I are with the bench. 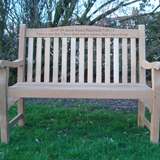 We hope to have it installed in the church yard when the weather improves. I'll send you a picture when in place. Thanks Marlena, it's now sitting in its permanent home next to the cricket field. It looks really good. 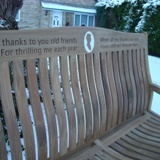 I have just been to see the bench installed today and it is lovely. I wanted to ask if we need treat the chair annually to keep it looking so lovely, if so what should we use? 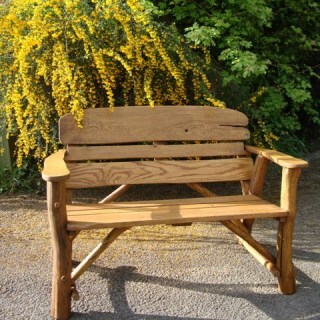 Thanks for sending the photos of the bench. It looks splendid and I look forward to seeing in in place at Greenmount later this year. Apologies I missed your calls and emails, the site has been closed down over Christmas. I have checked over the bench and it look perfect. Many thanks and all the best for 2018. 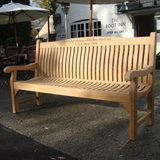 Just a quick message to let you know we are very happy with our bench and is positioned in the heart of the village where my father lived. Thank you for all your help and advice and the way you took us through things, I am a bereavement counsellor and I think you did a great job. I've attached some pictures to show you how the bench looks and the village, being winter does not look it's best, but we're happy. Yes, the bench is very nice - looks great. My mum's been to see it and she's very happy. Thanks for your help and I wish you a merry Christmas too. 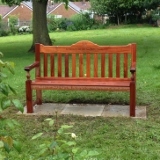 Dear Marlena, A huge thank you for all your help over the last year...we finally have my dads memorial bench in place. 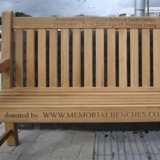 We just wanted to send you and your team a great big thank you for doing a superb job of the memorial bench. 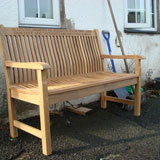 We went through to Wortley to see it and Rob applied the teak preservative to it. We are delighted with it. 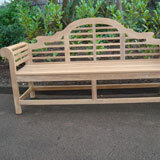 We have sent a photo to you of the bench now It has a coat of preservative! We think it looks beautiful. Once again thank you to all those involved. Just a note to say that my order was delivered today. I just wanted to thank you for all of your help, and those extra phone calls to confirm delivery and addresses. You've been very kind and it is appreciated. The finished product is perfect and just what we were hoping for. 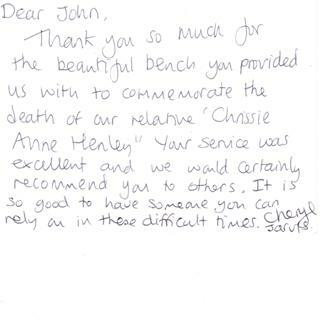 Yes the bench arrived on Tuesday and all good and John was very helpful. 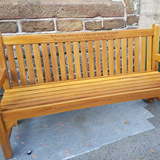 We are very pleased with the bench and will be using it tomorrow when we have a concert in.the church and hope to fix it in place in the Lychgate next week. Really happy with the bench & quick delivery. 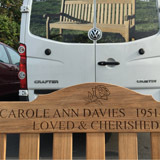 Thank you for delivering Dad's bench on Friday, I have been talking to Ann regards us (Mum, my brother & me) going to see it later this week. However, Ann had sent us a photo & it looks fabulous. Please can you pass on our thanks to John too? 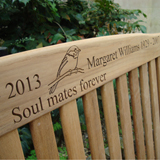 A massive thank-you for creating such a lovely bench with fantastic engraving. As requested, I have attached a photo of the bench in situ, high up a valley in the Scottish borders, overlooking a small body of water called Loch Eddy! I hope that you like it! I would just like to thank you so much for your help & commication. 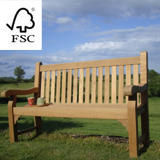 Your service has been excellent & we are over the moon with the quality of the benches. I just wanted to say thank you for this bench. It looks fantastic and is a fitting tribute to our late grandson Brandon who passed away at just years old. Thank you for your email. The bench was safely delivered and he loves it thank you. Thank you very much for your help with this and for getting it to him before Christmas. 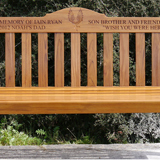 Many thanks for recent delivery of the memorial bench. 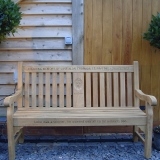 The bench is beautiful, a wonderful memorial of our lovely husband and dad. The delivery driver was friendly and professional. Thanks again for your helpfulness and excellent service. Thanks so much, we are thrilled with the bench. Bench arrived safely today very prompt delivery it is absolutely all I expected it to be and more, once again thank you very much. So sorry, I meant to write,- YES! My beautiful bench arrived on Friday!!!! Thank you for all your help and excellent service! 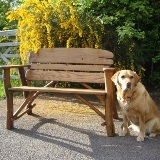 Have been to the home today to see the bench and it looks lovely. Thank you very much. May I thank you for the excellent service and beautiful engraved bench you provided us. It looks perfect in my mums garden in my dads favourite spot. It is a fitting tribute to him. Thanks on behalf of the Kershaw family. Thank you for the bench which arrived on time this morning. It looks really good and is now secured in the Church grounds. I'm sure it will give many hours of pleasure to all the people who visit it. Thank you and the team for very good service, from initial order to delivery. 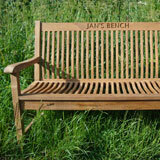 The bench is excellent and the engraving is just as I had hoped. 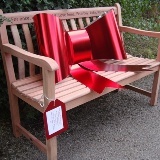 The bench is lovely thankyou, tucked away in the shed only waiting now to be installed. I am delighted with it and I am sure the family will be as well when they see it. 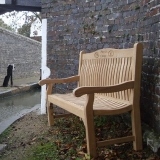 Many thanks for pictures of the Craske bench. Yes, everything looks fine. I am very pleased with the results. 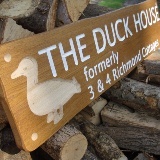 The fact that the writing is actually cut into the wood makes all the difference - better than a boring brass plate! 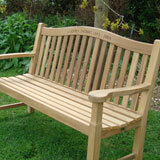 Just a note to say thank you for the excellent service when we ordered our bench recently. It was ready earlier than expected, which meant we were able to link the surprise in with a visit to my parents, which was great. But more importantly, your communication with us at every stage was way beyond what I'd normally expect, and was very much appreciated - thank you. Thought you might like to see the bench in place on the golf course with my granddaughter and myself enjoying a sit down. 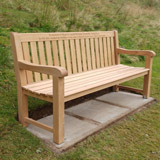 Everyone at Sherdons has remarked what super quality the bench is and some golfers saying the best they have seen. I know that my husband would be very proud. Unfortunately I noticed today that one of the bungs in the bench anchors has gone missing,is it possible to send me a couple of spare bungs. 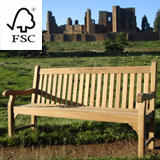 I am just writing to thank you for the great service you and your company have given me over the benches. I have just been down to view the finished job and I am delighted with them. I have been meaning to send you some pictures of Doigy's bench and this evening I have had my conscience pricked! Tonight I had dinner with Jo and she was telling me about her recent visit to your workshop and how helpful and lovely you were. 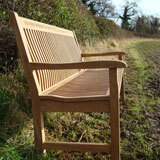 So I have attached some photographs to show you the bench in situ and the view from the bench. Every time I'm there someone stops to admire the workmanship which is lovely. I can't tell you what it means to have somewhere special to go and remember him. To see his name so beautifully represented makes me sad and happy and proud all at once. The pics aren't great quality but I give my permission for you to use them if they are any good to you. Thanks again for all you and your team have done.Wonderful. 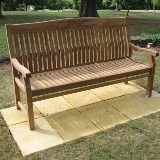 I went to Hinchingbrrooke yesterday and saw our bench. I just wanted to tell you how thrilled we are with it. 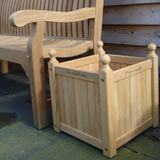 The craftsmanship of the bench and the colour of the wood are truly first rate. The engraving is the most beautiful I have seen.Absolutely stunning! I can't thank you and your team enough for the wonderful service you provide and the fantastic product you supply. 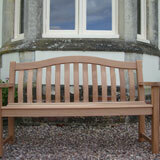 Bench all arrived safely and is already a hit! Many thanks for your great service and quality of work. 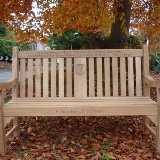 Just wanted to say how delighted we are with the bench, it is beautiful and our friend would have loved it. 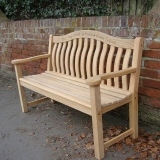 Many thanks for delivering the bench on Saturday - looks lovely, thank you very much again. Many thanks, I understand from dads partner is extremely pleased with it. Just to thank you for this. 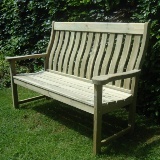 We are very pleased with your handling of the order and we love the bench - it is just perfect. And thank you to John, who did the engraving. On behalf of my family, I'd like to express our thanks to you for your excellent service. 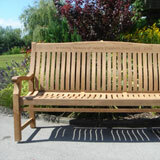 Your advice about our order was helpful and the bench was installed in good time despite short notice. Many people commented at its dedication on how good it looks and we feel it is a beautiful tribute to our wife and mother. 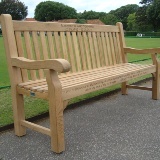 I went to the golf club a few days ago to see the bench. Thank you, it is absolutely just what I wanted and looks lovely on the patio there. It it true to say I am delighted with it. 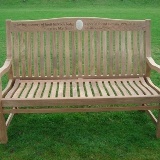 Thank you for your delivery, the bench is installed and appreciated by everyone. The whole family is very pleased with the bench and thanks you for your help. 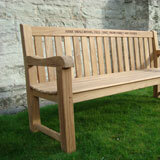 Thank you Johns bench was delivered yesterday! Its lovely and a fitting tribute! The golf club need to know if it needs treating every year and if so what with? I would just like to say thank you so much for the Beautiful Bench that was delivered yesterday it exceeded all our expectations and will now have pride of place in the grounds of our establishment. 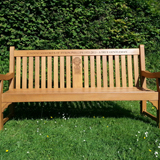 The bench was purchased with money raised from various events that staff had organised for our late friend & colleague Keeley and we could not have asked for anything more. 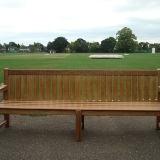 The bench was delivered this morning about 8.30 am in good condition, we are very pleased with the over all look of the bench. 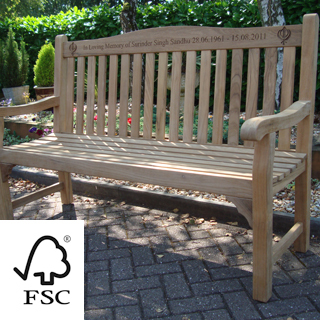 The picture you sent us does not do the bench justice seeing the real thing is much better." 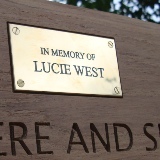 We are naming the bench our missing angel " as we still have our other three angels here with us. 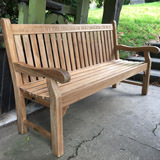 thank you for all your help with the purchase of our bench and could you pass on our thanks to everyone involved in the making of our bench we will send you photographs of the bench once it is in place. It's arrived safely and looks lovely. 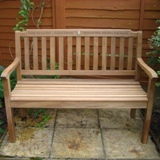 We are absolutely delighted with the bench we recently purchased from you which we have now stained with Golden Care Teak Protector, photograph attached. It looks fantastic! The bench we ordered arrived today and I just wanted to thank you and your team very much. 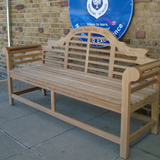 It really is a beautiful piece of craftsmanship and Mr Yunus' family, friends, pupils and colleagues of the school will enjoy seating and looking at it for the many years to come. 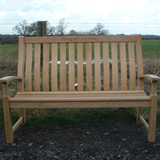 I just wanted to let you know, my clients came at the weekend to see the bench and they are absolutely thrilled with it. So thank you very much. 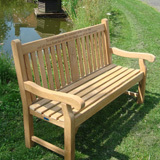 I have still not tied down my other lady with the bench but will be with you soon with the order. 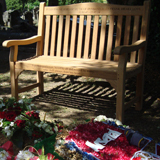 Been to see Allan's bench today. All the family are delighted. Thanks for all your help and the prompt delivery. Just a quick line to say thank you . The bench looks very nice and also I must add that Barrett was such a help and I know that the paving was not as perfect as the Indian stone paving he would normally be used to , but he did a very good job ! The bench is fantastic! Thank you thank you thank you my sister loves it! First class service and customer service, well done to you Marlena and thank Julian for me. Shame all companies are not like you. 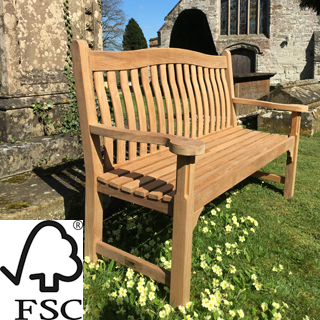 A massive thank you for the fantastic service and the beautiful bench. We all had a little cry when we saw it - it is perfect. Now looking forward to seeing it up at the church. That was so quick - what can I say except thank you so much. The service from your company is quite frankly amazing - from all the help you gave me through to this news. 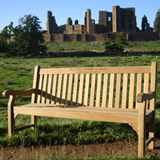 I thought I would just drop you an e-mail to say how over the moon I am with my Kenilworth teak bench that arrived on Thursday. 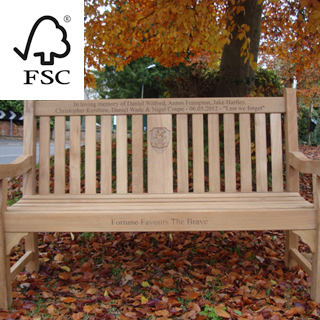 I am so pleased with every aspect of the bench; it has far exceeded my expectations, is an absolute pleasure to sit on, and the engraving is wonderful, it's perfect. It has been a pleasure dealing with your company, it was easy to order, was processed really quickly, and the delivery was spot on, and the gentleman that brought it was extremely helpful and polite. I would not hesitate in recommending your company at any time. Thank you, you have made me very happy. All at the club were hugely impressed with quality. 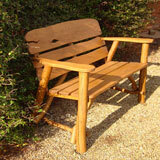 I write to confirm delivery of our Kenilworth Teak Bench and to say how delighted we are with it. The engraved inscription is exactly what we hoped for and is a fitting memorial to the lady concerned. We are sure the seat will be appreciated by all visiting the community garden and we would like to thank all concerned for their help and efficiency. 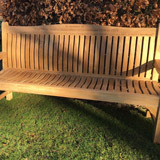 Would just like to say thank you for the bench we are very pleased with it, just wondering what would you recommend we use to keep the bench at its best. 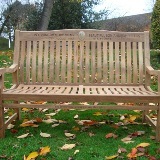 Just a quick note to say thank you for the memorial bench which was delivered on Wednesday. I went to see it yesterday and it's perfect. The delivery team were great too. Thanks again for your great service and professionalism. Just to let you know that the bench arrived today. We were very lucky, because I got home from work and found the delivery company had been earlier in the afternoon, and left a note. About 5 minutes after I got home the delivery man came back, and I was really grateful that he had tried again. He was very helpful, and you may like the feedback on how well this delivery company performed. I would like to take this opportunity to thank you for the fantastic job you have done on the bench and planter. Thanks for all your help and advice and Barrett was a credit to your company. 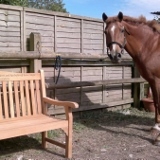 would just like to say the bench is fab and loved by all thank u soooo very much. 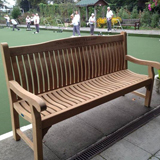 We are delighted with the bench and have been really pleased with the service that your company has given from our initial enquiry to the installation. Would certainly recommend you to others. Thank you for your email. I will pass on your message to Sam. 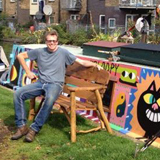 The bench I understand looks wonderful, I look forward to seeing it this weekend. Just to say how amazing Hannah and her colleague have been organising this. 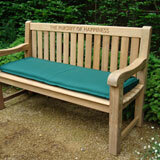 Following my order for The Turnberry Park Bench I wanted to place on record how delighted I was when I viewed it. A beautiful piece of Furniture and the Wood engraving was superb and so crisp. Extra thanks also to the delivery guy who unpacked and removed all the packing. A good experience and a fitting Memorial to my Dear Wife. I just wanted to thank you for such a great service. 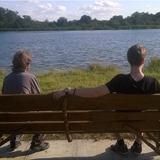 My brother and I are absolutely thrilled with the engraved bench we purchased for our parents Golden Wedding Anniversay as I am sure they will be. Received with thanks, looks lovely. Thank you. 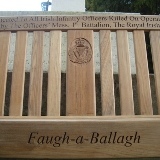 Thank you so much, the bench is absolutely amazing!!!! The chap who brought it (I didn't even ask his name....sorry!) has made a fabulous job of installing it, thanks so much for all your help will definitely recommend your company, you have been amazing from start to finish. 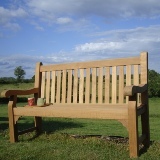 Just wanted to drop you a note to say the bench is wonderful and it was lovely to finally get it in position. We hope people will sit on this for many years to come . Thank you so much for the beautiful bench. My boys are going to assemble this on Saturday and hopefully start some more memories! 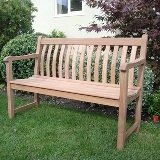 Just to confirm that the bench has been delivered and is of lovely quality. 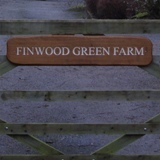 Alison brought over our new name board yesterday. It is VERY nice indeed. Thankyou all very much indeed. Bench was delivered today and we are thrilled with it. Your customer service from ordering to delivery has been second to none. Just wanted to say thank you for the bench - it's just what we wanted! The 'ceramic' was received last week - thanks for that too - AND the 'lifting' of the hand was managed - excellent! 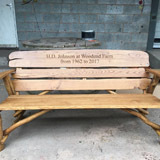 The bench is not yet installed in its final location but will be in time for the family memorial service in September, when folks from around the globe will join together around the bench for a celebration of Pam and Alf's lives. The bench looks great and I thought you'd like to see it installed. 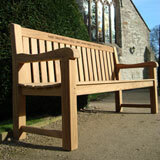 The bench arrived this morning, we are very pleased with it and thank you very much! Just a quick note as I am out on the road. Plaque has arrived and is wonderful. Thank you so much for all of your help. I will promote your business for you. Thank you so much for the fabulous bench. I was very anxious about the responsibility of spending our collection money and somehow getting it wrong. I needn't have worried. The prompt customer service that I received was excellent. The mock up picture of the back rail showing the wording was perfect as I just needed to SEE what it would look like before I went ahead with the purchase. The delivery was spot on, as arranged. It is excellent quality and in daily use. A perfect memorial for our dear friend and her horse. Everyone who contributed is really very pleased . 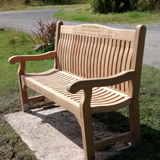 I know its been a long time since we were in touch but it was only last week that we had the opportunity to visit Grasmere and see the bench for ourselves. It is beautiful and in such a lovely position overlooking the beautiful gardens of the hotel with the mountains in the back ground - it couldn't be nicer and I know that mum and dad would approve! 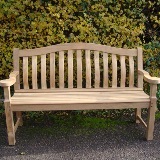 Thank you very much for my memorial bench. It is lovely and looks well on my patio. Many thanks. 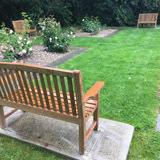 Thank you very much for the bench which is now been installed; we are all very please with the result, the guy was very professional in his approach to the work that he had to do, first class. 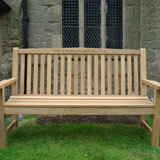 Just to let you know the bench arrived safely today. The delivery man was very kind, helpful and polite, and carried out his duties in an exemplary fashion, he is to be commended. 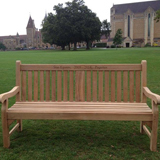 The bench is lovely and will provide a fitting memorial for a much loved and greatly missed colleague. It will be placed in pride of place at the front of University Dental Hospital. Many thanks to you and your company for a brilliant job. I have seen the bench at the hospital & am really pleased with it. Your delivery driver was also very friendly and very helpful. 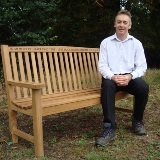 I would like to add my thanks to those of Michael, now that the bench is in place, for a job well done. It was a pleasure to deal with you - and to find a common link with John! 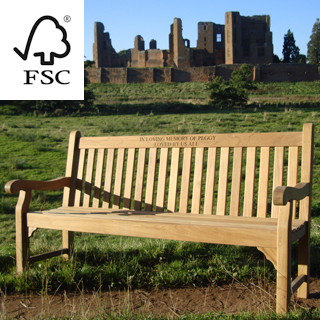 The bench will be an asset to St. Andrew's and has already been commented on favourably. When the spring comes, it will come into its own as a place for peace, quiet reflection and contemplation. I shall take pleasure in letting people know where it came from! Thank you. 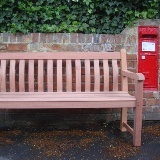 I have not yet seen the bench, but Judith kindly sent me pictures which look very good. 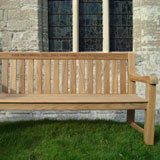 Hopefully, the bench will be of benefit to those visiting Shottery Church, for many years to come. 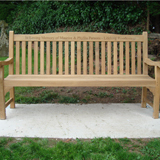 Thank you so much for your work last week in getting the bench delivered and installed - it looks wonderful. Please pass on my thanks to John as well. 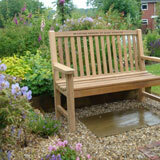 I am writing to say that we are so pleased with the bench it really is lovely and extremely good quality. The engraved Father Christmas is fantastic, it actually looks just like my Dad. 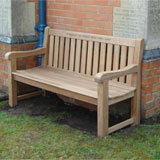 I would like to thank you for the bench delivered perfectly by Barratt to Darent Valley Hospital in kent. it was a pleasure to meet this gentleman who was respectful and professional in his job.I have no doubt he will be a success in whatever he chooses to do.Thanks also to the lady who took the order and asssured me everything would be done perfectly.ten out of ten. 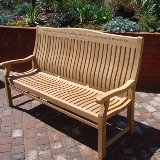 I purchased the "Chelsea" bench with Brass Commemorative Plate. who are thinking of purchasing any of your merchandise. I would like to thank you for the beautiful bench we received on Thursday in memory of our daughter Bethany Paige Adams. 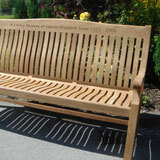 The bench looks stunning and we will enjoy spending many hours sitting on it next to Bethany in the cemetery. 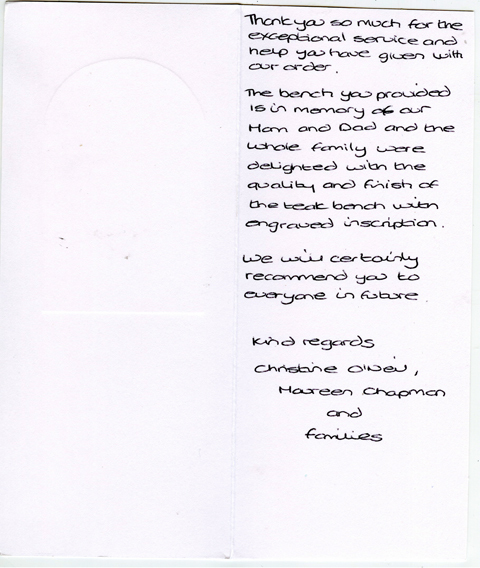 I cant thank you enough for the service recieved by your company, i was worried i had left it to late to obtain a bench with the inscription i needed, but you made the coming weekend easier for me as its my sons first anniversary and needed the bench to help his friends and family through a very difficult time, so thank you all very much what an excellent service. 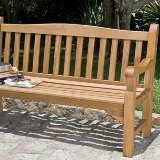 Thank you so much for the excellent service and your kindness when I ordered the bench for Terry. 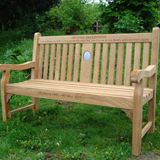 I just wanted to say 'thank you' for the beautiful bench you provided for me, in memory of my mum. It arrived promptly on Monday and I helped site it today. It is nestled in amongst the trees and will be a lovely spot to sit and think of my mum. 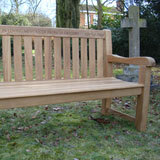 I just wanted to send a thank you note to say how pleased I am with my memorial bench and the engraving. Also I wanted to thank the young man who delivered it who was really friendly and kind, despite my tears. 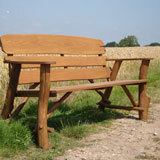 I would certainly recommend your services to anyone who is considering buying a bench. really appreciate you doing it so quickly too - you saved my bacon! My parents are having their golden wedding next year - I'll be in touch! Have returned back to Leeds from Wales and so the first opportunity to pick up on my emails. The bench arrived safely. I was concerned about the lorry negotiating the narrow roads and finding the place but fortunately the delivery driver was familiar with the area. It is now in situ, and looks lovely. Just to let you know - it arrived with perfect timing and our father was deeply moved by the gift and wording and the cards. The bow and card were perfect. attention and all your help. 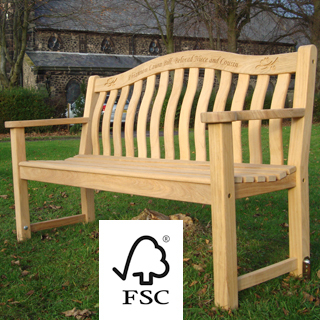 We are delighted with the bench. 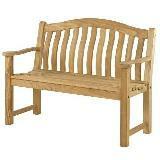 I would just like to say how thrilled the family are with the bench we orderd. 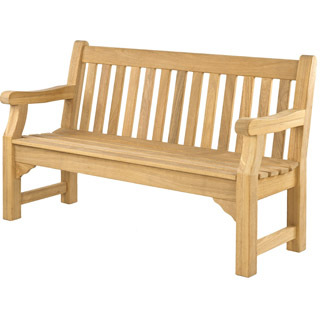 many thanks for such a good quality bench. Just to say thanks for all your help with the bench. We are all very pleased with it. 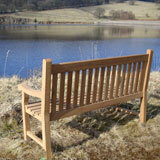 for your information, I confirm receipt of the memorial bench for Gary Townsend. 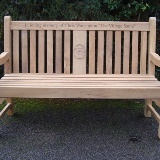 Just a note to say we are very pleased with Bill Begbie's Memorial Bench. 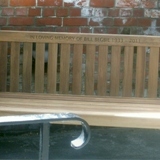 A lady yesterday said she could imagine Bill sitting on the bench. 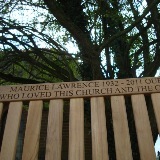 I believe he would be proud and pleased with the bench. We are getting some plants and decorations to compliment the bench. Just a very quick note to say thank you very much for your help with Dads - he was absolutely over the moon with it. Haven't seen it myself yet but my brother (born cynic) says that it is excellent value for money. 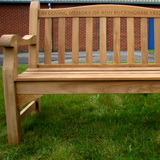 Thanks very much for delivering our memorial bench. 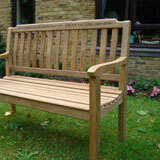 We are thrilled with the quality and workmanship and are sure it will make a lasting tribute to our friend. 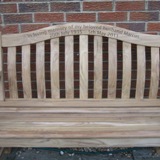 Just wanted to say a big thank you for the beautiful bench you made for us in memory of our dear Mum. 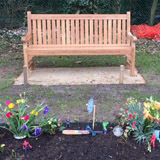 We went to visit the residential home where our Mum had been living and where you delivered the bench to, when we saw it in all its glory out in the sunshine and looking beautiful it bought tears to our eyes! 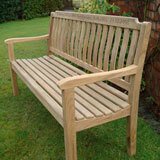 Many thanks - bench is lovely & very impressed by it's quality. I understand the chap who delivered it was very helpful so please pass on our thanks. We will Definately buy again. I would also like to take this opportunity to thank you for the bench. It will prove a fitting tribute to our colleague and fits in perfectly with the location chosen for it. Thank you - it arrived ok and looked great. 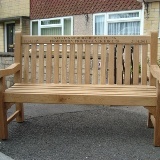 Just a quick not to thank you for the memorial bench delivered last week. I have now seen it in situ and it looks beautiful. The family and the council members are very pleased with it. Just to say thanks very much to yourself and your colleagues for such an efficient and thoughtful service. It was very poignant that the delivery date was Good Friday as mum was of the Catholic faith. And just in time for the warmest Easter in living memory!! I'm very much looking forward to seeing it for myself when I next visit the North-East. everyone loved it. I have attached a few photographs for you to see. It has arrived safely this morning and is exactly what we ordered and wanted - thank you for doing such a good job and for being so professional in executing it! The bench arrived safely in Castellar and we all want to thank you so much for the trouble you took in arranging to get it over here. 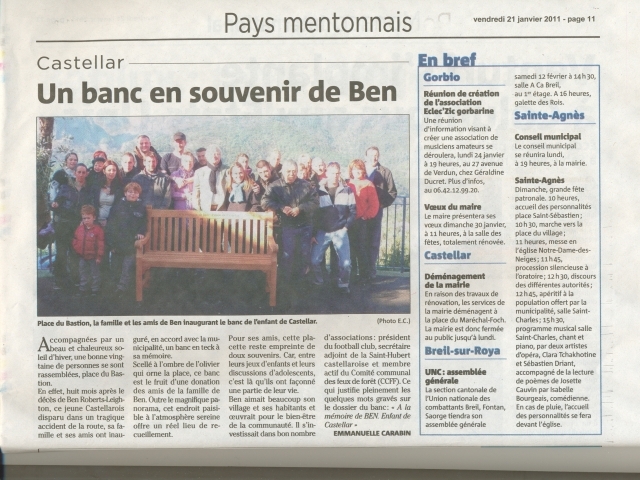 There was an inaugeration ceremony last Saturday when Ben's family and friends put the bench into position overlooking the mountains and in the shade of an olive tree. 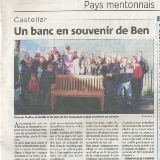 Ben was very much loved and respected in the village of Castellar and the inaugeration of the bench even made it into the local paper. I thought you would be interested in seeing the attached article. 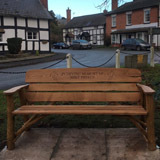 Once again thank you so much - the bench means a lot to a lot of people and we hope that it will become a meeting place for the young people of the village for years to come. Thank you for the great service and help when placing the order. 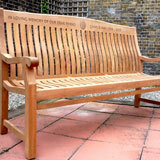 the bench is beautiful and we are really pleased with it. your driver today -on time and very helpfully. of my late, beloved wife. to the family on 25 September. your website if you so wish. amazing tribute to my dear late wife. I forgot to add in my original e-mail how impressed I was with your driver. asset in providing outstanding customer service. no guidance in delivering customer satisfaction. Obviously I looked around prior to choosing my supplier and placing an order so I was happy with my choice but actually seeing the finished product just confirmed I had made the right decision. The quality and design are really pleasing and I am so happy with the way the engraving turned out. Thank you to all concerned (from designers, manufacturers, administration, right down to the delivery driver) for whatever part they played in making this possible. Needless to say I would have given anything to be in a position whereby I had Peter here with me and hence not given him such a "gift" for his birthday - but I cannot change the circumstances and now there is a lasting and fitting memorial to him, which will be admired and enjoyed for years to come. in memory of Mabel Stuart. The quality of materials used and the workmanship is outstanding. 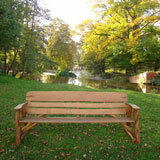 complete tranquillity which can be enjoyed by all for years to come. and the breeze rustling through the reed beds. 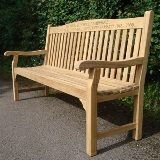 Many thanks for the delivery of my memorial bench this morning. I am absolutely delighted with its quality and 'presence'. 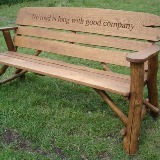 Just to say that the bench has just arrived with us - and we are totally thrilled with it. Couldn't be more perfect. Thank you so much for the superb attention that you have given to us in purchasing something that is so special to us all here at Gisburne Park Hospital. A special thank you for the photographs e-mailed to me which I received today. I would like to thank each and everyone of you for the beautiful bench on behalf of myself and my deceased children thank you ever so much. 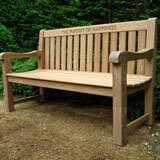 We have just viewed the bench, and must say we are delighted with it. It is absolutely outstanding, and our father would be so proud of it. Thank you so much. Memorial Service was held for our son David. Company - what a beautiful piece of work! Thank you so much, it helped make our day such a memorable one. 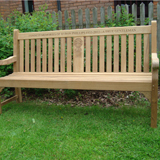 We would like to thank you all so much for facilitating the delivery of the beautiful bench in memory of Robbie who was killed in Afghanistan in June. We were able to deliver the bench to its place in the village and both of Robbies parents were there along with most of the village. 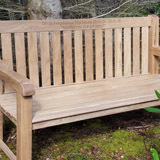 Thank you very much for the beautiful bench in memory of Robbie McLaren, which you kindly supplied so promptly. The design and quality is excellent, and the lettering clear and well done. It is also very comfortable and much appreciated by all. 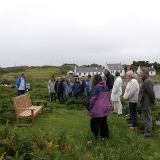 Last Sunday we had a village gathering to place it in a lovely peaceful spot on the side of Kintra bay with a magnificent view out to sea .I hope you will receive a photo from Mr. and Mrs. Todd who organised the purchase for us. Better still.......come to Mull and see it in all its beauty! 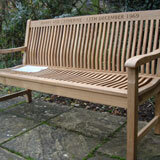 I am so pleased I chose your Website/Company when I orderd the Oxford memorial bench. 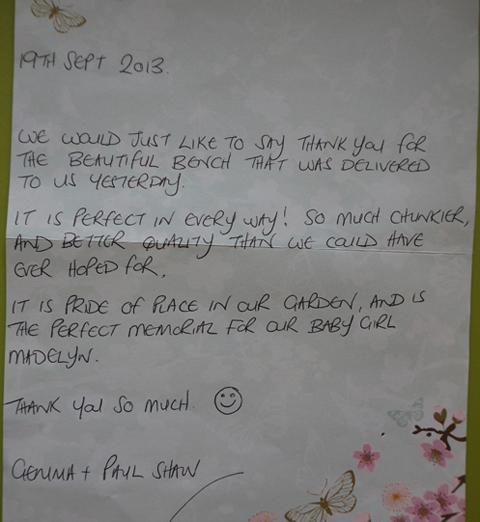 Your customer service is exceptional, the gentleman who deliverd the bench couldnt have been more thoughtful and kind. The bench is perfect, I cant thank you enough. so pleased. I'm very grateful for all your help. I am so very pleased with the bench. It looks absolutely beautiful. I will send a picture of it in it's new home on a sunny day. And very nice it is too! Thank you. 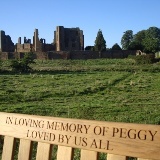 We would just like to offer our sincere thanks for the way everything was done regarding our daughter Debbie's bench. 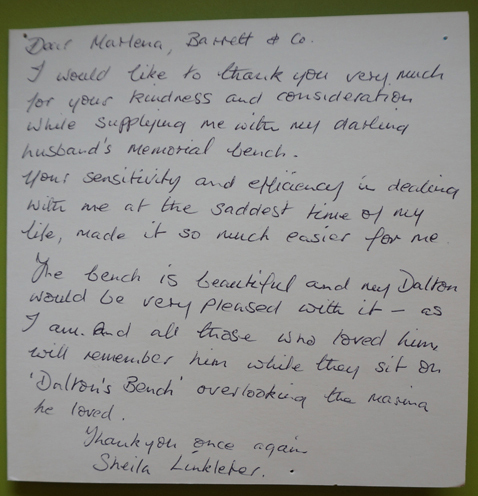 From the start our order was dealt with sympathetically and efficiently. The delivery went exactly as you had said and the man who brought the bench was very, very nice. The time was between 5-6pm as you said too. 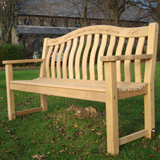 We are extremely pleased with the Malvern and would recommend you to anyone who wanted not just a memorial bench but all you have to offer. If you would like to put our comments on your web site please do so as we are delighted with your services. We felt that we were not just a customer number. Once again thank you so very much. We are so pleased to have used your web site. 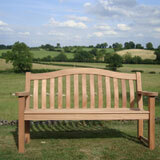 Thanks very much for the fast delivery of our teak memorial bench. I wanted to thank you for the delivery of the benches for NORSUF this past saturday. 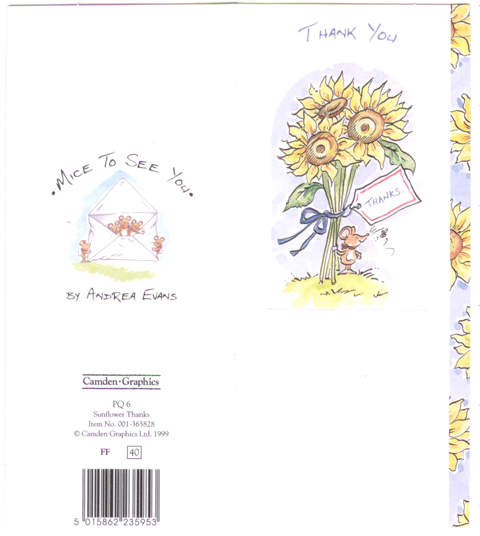 On the day they arrived I wrote to Rother Homes, advising them of their arrival. I have also sent a photo of them to Mrs Angela Sharmon from Rother Homes to include in their future newsletter. Mr Caldwell, I wish to thank you for your professionalism and kindness in all the assistance you provided as well as your patience in waiting so long for payment. 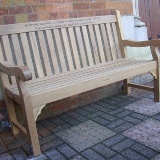 The memorial bench for my Dad was delivered today and I just wanted to say thank you very much. 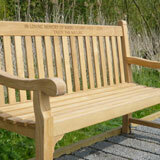 The bench is very good quality and the inscription is perfect. We are very pleased with it, you have a made a family very happy. Please pass on my thanks again to driver who delivered the bench. He carried it quite a distance and nothing was a problem for him. It makes such a difference to deal with professional, extremely helpful and friendly people. From the moment I placed the telephone call with Camilla my order and particular requirements have been dealt with exceptionally. Thank you again and I would most definitely recommend your goods and services. 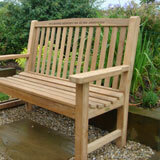 Many thanks for the fantastic bench which arrived today. We are extremely pleased with it and thank you for an efficient, supportive order and delivery. with it. Thank you for your thoughtful and efficient service. 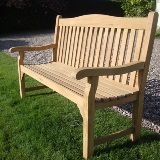 I can confirm delivery of the bench and I am delighted with it. would be delivered to the hour. Thank you, all arrived safe and sound, we are very pleased. Thank you. It has been received and we are extremely pleased with it. are already installed and on duty...many thanks...! Thank you, it arrived this morning. Looks very nice quality but haven't been able to try it out yet - because of the wet weather! 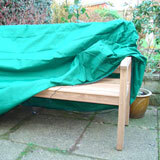 I would like to say thank you for delivering my bench earlier than the deadline i gave you in January 2009. The quality is high and the carved inscription looks brilliant and is easy to read. I will definately recommend you to others and i will not hesitate in placing an order again in the future as needed. I'm hoping for a swing seat someday. I am writing further to my phone call to thank you for your excellent service. 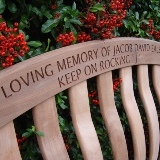 Having ordered a memorial bench online i was not sure what to expect. calls to warn me of its arrival.